Benny Thomas has done his Chartered Accountancy from the Institute of Chartered Accountants, India and has graduation in Commerce from University of Calicut. He has over 15 years of multi-domain exposure in driving process implementations & guiding companies to greater efficiency, performance & profitability across pharma, life sciences, telecom & IT. Track record of setting-up & improving accounting operations, internal controls & finalisation of financial statements as per Indian/ US GAAP & IFRS. 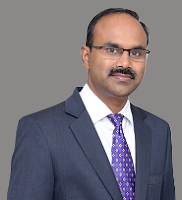 He is responsible for entire gamut of finance & accounts, including financial planning & analysis (MIS), short/long term strategy, budgets, Hyperion reporting, insurance, direct/ indirect & international taxes, FEMA/RBI & EOU compliances, treasury/ fund management, audits, representation to statutory authorities & assessments, variance analysis, financial systems, and policies & procedures.